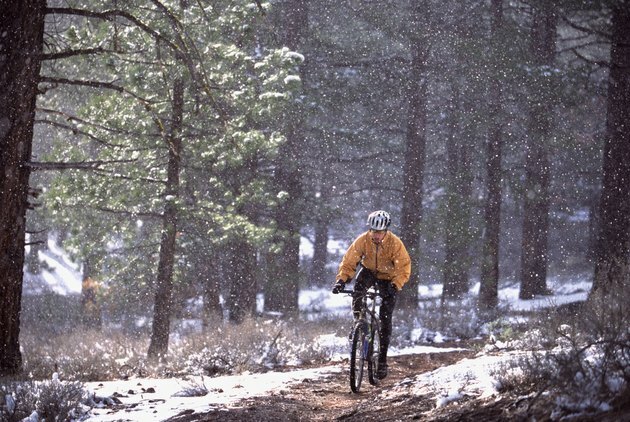 Mountain biking takes your cycling routine off-road, where stable terrain and smooth inclines rarely appear. Rough trails and complex obstacles require good positioning to traverse, and getting your seat to the right height plays an important role in how well you maintain your balance. A properly positioned seat also improves your pedaling efficiency, which makes the bike feel faster and lighter so you can pound up the hills. First and foremost, your mountain bike must fit your proportions; seat position cannot compensate for an improperly sized bike. Frame measurements reflect your inseam, known in cycling as your pubic bone height. Measure the distance between the base of your pubic bone between your legs to the base of your heel. This should line up with a manufacturer's size chart showing the ideal frame size for someone with your proportions. Some mountain bike manufacturers use generic sizes of small, medium, large and extra large, but they typically provide a corresponding chart. To set your seat height, lean the bike up against a wall so you can mount it without it tipping over. Next, adjust the seat height until your knee extends just short of perfectly straight with your crank and pedal pointed straight down. Stretching to reach the pedal means you went a bit too far. You shouldn't have to bend your foot down at all to reach the pedal; keep your foot and leg perpendicular and your ankle relaxed. Once you position your seat, make sure it's parallel with your top tube and tighten the neck of your seat tube. Downhill bikers use a different riding position entirely from a traditional cross-country bike. In this variation of mountain biking, the seat gets tilted and set back so the riding position shifts toward the rear of the bike. When the bike barrels down a steep incline, this position keeps your weight above the back tire, reducing the chance that you end up going over your handlebars. For downhill, a frame size on the smaller side for your inseam can be easier to handle, but larger frames remain more stable at high speeds. Many riders drop their seats to a slightly lower height when they attack an aggressive downhill trail to maintain balance and control. You may not get your seat adjusted perfectly on your first try. Pay attention to any rubbing or soreness you experience during your ride, and try shifting your seat forward and backward to find the most comfortable position. If you have trouble getting weight on your sitz bones, you may need a seat with a wider or narrower base. A bike shop with a fitting expert can help you find a seat to fit your hip proportions.